From the outset, Radiation Island lacks context. We see a warship materialize in the Devil’s Sea, the crackling green energy that surrounds it soon causing three nearby islands to phase into existence. I had to turn to the game’s Nintendo eShop description to make sense of it all, and, even then, it left me with more questions than answers. You participated in the Philadelphia Experiment, and, when something went wrong, you end up in a parallel, alternate reality. And, that’s it. It’s as good excuse as any to strand you on a remote island, a place where you must fight for survival while working out how to return to the real world. The opening tutorial covers the basics. Whether that be movement, stressing about your health and hunger levels, using flint and twigs to craft a stone axe, learning to harvest materials, or the importance of using your notebook to get your bearings, it’s simple enough for most players to easily grasp. There are three game modes to choose between, which, for whatever it’s worth, is a permanent decision until you choose to restart with a new profile from scratch. Adventure is “the intended way to experience the game,” meaning that you will need to eat to survive, animals and zombies will attack you on sight, radiation is deadly, and death will result in you losing your equipped weapon. Survival is suited to “the most seasoned survivors,” a challenging experience where enemies drop less loot, resources are more scarce, and death will see you lose everything in your inventory. And then there’s Exploration, which lets you freely explore the island without having to worry about enemies, food, radiation or anything else. I chose Adventure, but it didn’t start well. After stuffing every item that I could find on the beach into my backpack, I spotted a futuristic-looking console nearby that displayed a map of the island and set off in the direction of the nearest tower. I soon encountered two zombies stood near a cliff, and, after discovering that a stone axe is a completely useless weapon to defeat them with, promptly died. My second run wasn’t much better, ransacking a house that I came across to uncover a diary that talked about a top secret 701 unit in the Imperial Army, only to end up being chased down and mauled by a tiger moments later as I continued to explore. As with any game, you will learn to adapt to your failures in Radiation Island. Pressing on to uncover the codes needed to disable the tesla towers that crackle and spark above the island, you must consider the day-night cycle as you set out to discover what has happened – more danger waiting for you when it is shrouded in darkness. There are journal tasks to complete and unending materials to collect in order to craft items, but the experience can often feel too wayward and unforgiving. After yet another rabid wolf had inflicted me with bleeding – an immediate death sentence as I constantly struggled to even find the materials necessary to craft a bandage – I switched to the Exploration mode. The animals and monsters unable to hurt me, I was able to more easily see what secrets were hidden around the island – not that there are many. I started to have a much better time with Radiation Island though, in not having to fret about keeping my character alive and being able to knock out oblivious enemies with a one-hit punch to steal whatever they were carrying. 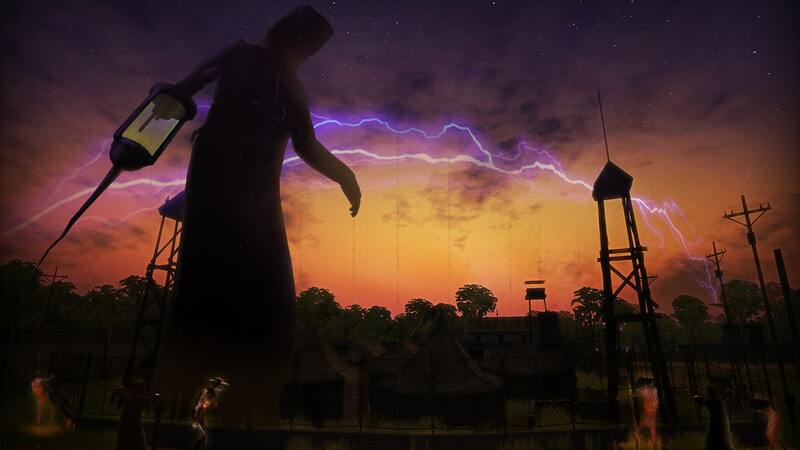 With Radiation Island, Atypical Games has achieved a commendable sense of scale. But, that comes at a cost. The island is a bland and sparse playground to explore, lacking any real sense of discovery to encourage you to continue in your search for answers. Chests that you open in buildings can reward you weapons to aid your survival – katanas, crossbows, and such like – but, aside from the countless trees, animals, and zombies that it is littered with, the game’s world is a boring place to exist in. In essence, Radiation Island is a zombie-infested survival adventure game on a budget. It is yet another mobile game that has washed ashore on Nintendo Switch and one that fails to ever become a memorable experience on the portable home console. It has clear potential but ends up feeling incomplete, in needing more content to help keep the player both engaged and motivated.